Holy Trinity’sVacation Bible School: “What’s the Manner?” begins tonight, June 18, 2018, and continues through Thursday in the Parish Hall. The program includes activities, crafts, songs, and dinner each evening. Our Church School offers VBS free of charge for all children aged 4 through the sixth grade (friends/neighbors especially welcome). Parents may still register online or at the door tonight. Holy Trinity’s Vacation Bible School: “What’s The Manner?” begins next Monday evening, June 18, 2018, and continues through Thursday, June 21 in the Parish Hall. The program includes activities, crafts, songs, and dinner each evening. 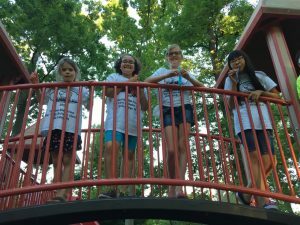 Our Church School offers VBS free of charge for all children from the age of 4 up through those entering sixth grade in the Fall (friends/neighbors are especially welcome). Parents are encouraged to register and complete the release forms online as soon as possible. Dn. 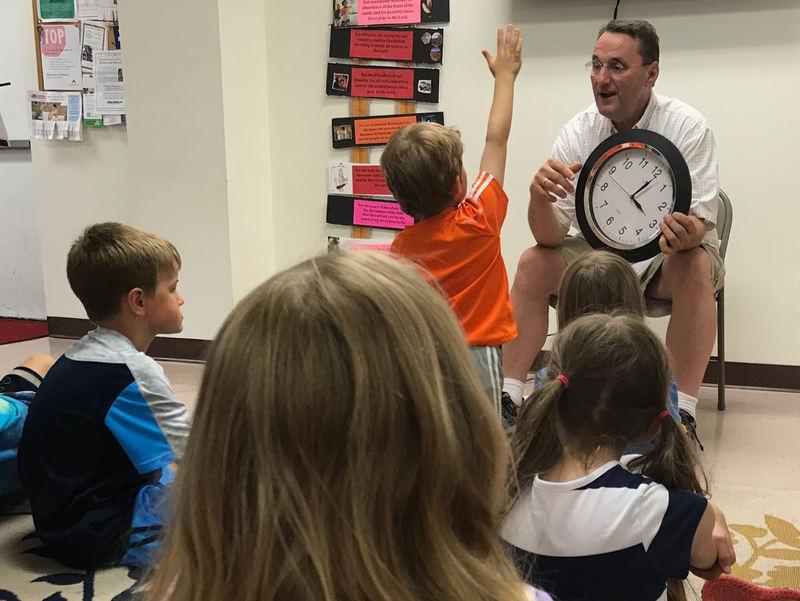 Mark teaches Vacation Bible School participants about the Hours (1st, 3rd, 6th, and 9th) that can be prayed to sanctify the day. Do you make a checklist of all the things you want accomplish each day? Have you ever noticed that by the end of the day the list seems to be longer than when you started? You’re not alone—overdoing is a social epidemic from which people of all ages can suffer. It seems to me that “do not overdo” may be a healthy commandment which could be added to deal with our modern lifestyle. Because we want to do so many things so quickly, much of our worry is due to our mistaken view of things. We look too far ahead. The magnitude of life daunts us. We add tomorrow’s task to today’s and then of course the burden becomes too heavy. If we think about it, we truly never have anything to do on any given day but just the bit of God’s will for that day. But what part of daily lives do we dedicate to do God’s will? Related: Register online for Sunday School. Starting with the understanding that we must take care of our families, perform the work that our employer expects, eat, take care of our home, and so forth, we are reminded that the “heavenly Father knows that you need all these things” (Matthew 6:32). These take up the abundance of the day and fill it with activity. But we also must consider the sin of omission in our daily lives. In Matthew 25, we read that at the Judgement Seat of Christ we will need to account for those things which we did not do. It is not the big things we may have done (and for which we have sought forgiveness) but rather the little things we did not do that leads to our peril. These could be the calls or visits of help we did not make, the words of cheer we did not speak, the letters we did not write, or the hungry we did not feed—all lost opportunities to do His will due to our inactivity. Why do we leave so many things undone in our lives? Partly through sheer thoughtlessness, no doubt. Many omit the good deed not through want of heart but through want of thought. And yet it is just that very thoughtlessness which God calls for us to account. However, even more critical may be the emphasis we put on this life. We magnify the insignificants, pour out our energy on things which perish, and ignore the realities that alone count in the eternal scale. We spend our days “working our list” but not working God’s will—the things which call for our most constant care and deepest thought. As we begin this ecclesiastical New Year, let’s make our resolution to “seek ye first the kingdom of God and His righteousness” (Matthew 6:33). Put the emphasis in your daily life on His service and glory and leave nothing undone which the Lord commanded. 4:30 p.m., at Circleville Park. All families are encouraged to join in fellowship (and s’mores!). “Youth Equipped to Serve” Mission Trip. For the middle/high school students, there is a YES (Youth Equipped to Serve) mission trip planned in Pittsburgh this September 29-October 1. Please mark your calendars, as the number of participants may be limited. More details will be provided via the bulletin and website once registration opens. We Can All Live in an Orthodox World! STATE COLLEGE, PA — Today, the VBS students continued their exploration of what it means to live in an Orthodox world by focusing on the necessity of building a strong prayer life. This was emphasized with the introduction of the Hours services that are celebrated throughout each day. Spokespersons for the VBS stated that each day throughout the week the students discussed and learned about what it means to live in an Orthodox world. The focus was not on the fact that the whole world is not Orthodox but rather that through the wisdom of the Church we have be given a discipline to conduct our lives as much as God has provided and made us capable of doing so. To be sure, none of what started to happen this week can be accomplished overnight. There is no “instant” formula for teaching children about God. Patience and, above all, consistency are essential in attaining the desired results. True Orthodoxy is reflected in a way of life which is practiced in the home on a regular basis. To have children live one way at home and then suddenly to expect them to act differently in the church is an unrealistic approach. There is no reason to be afraid to set high standards for our children. 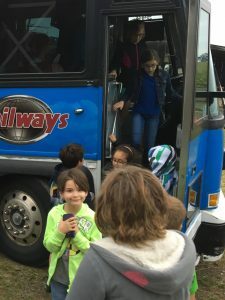 When we have high expectations, children not only gain self-esteem by meeting those expectations, but they come to love and respect those who set them. time. Every time we breathe we can remember God. The Matins service says, “Let everything that has breath, praise the Lord.” Let it be so for us and our children. Many thanks to the parents who encouraged their children’s participation in this year’s VBS. Our prayer for you is that you may guide your children through prayer and lead them by your example each moment of your daily life. Special thanks to the teachers. kitchen helpers. teens, and all the helping hands. Have a great summer! Every Hour and Every Day It’s Time to Pray! The daily Hours services correspond to the Old Testament services beginning each of the four “watches” of the day. in New Testament times, these services have been enhanced through their association with various events in the life of our Savior and of the Church. The First Hour commemorates the bringing of Christ before Pilate, which took place in the early morning hours. The Third Hour commemorates Pilates’s judgment of Christ and His mocking and scourging, and it is also the same hour when the Holy Spirit upon the disciples (Acts 2:3-15). The Sixth Hour remembers Christ’s voluntary Passion and His Crucifixion on Golgotha. Finally, the Ninth Hour commemorates Christ’s death on the Cross and its significance for our salvation. The Hours all follow the same structure, but within this arrangement each contains different psalms and prayers which relate to the event commemorated in that Hour and which evoke correspondingly different feelings in the heart of the reader or listener. Christians are to pray to God not just on Sunday mornings, but constantly, sanctifying time by offering prayer throughout the day. Ask your child what time should we pray. Tomorrow is our last day of VBS. 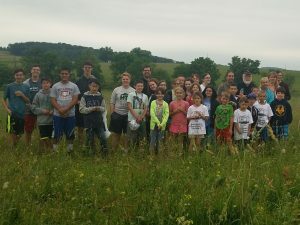 STATE COLLEGE, PA — Having come to the setting of the sun, the students reached the midpoint of VBS. Today the students continued their examination of what it means to live in an Orthodox world with the study of Jesus being our light in darkness. The focus was on the reality that through Christ the captivity of the soul has come to an end—the darkness is dispersed by the Light of Christ. creation: “And there was evening and there was morning, one day” (Gen. 1:5). The Vespers service in the Church begins with the chanting of the evening psalm: “…the sun knows it’s time for setting, Thou makest darkness and it is night…” (Psalm 104:19-20). This psalm, which glorifies God’s creation of the world, is man’s very first act of worship, for man first of all meets God as Creator. come. On the evening before the Divine Liturgy, it begins our movement into the most perfect communion with God in the sacramental mysteries. A real hero for Christ, Fr. Arseny, lived not so long ago in Communist Russia. Today the students learned how prison guards called him names, hit him, and would not let him wear his priest’s clothing. But prison leaders could not stop him from praying and he prayed for those who held him captive because he knew that they were very sad because they did not have the light of Christ in them. However, through his witness he was able to lead others to Christ even in the most dire and dark circumstances. Truly, the Light of Christ has shown forth in Fr. Arseny. 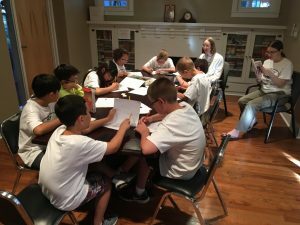 This year’s VBS students have been grouped by some of the names of the liturgical services being studied throughout the week. Ask your favorite VBS student their group and when their service is celebrated. Our dinners are especially kid friendly. Please encourage them to eat all their fruits and vegetables! 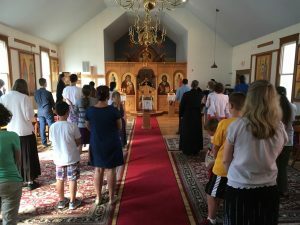 STATE COLLEGE, PA — Today during the opening session of the Vacation Bible School (VBS) being conducted at Holy Trinity Orthodox Church, the students were introduced to the VBS theme of Living in an Orthodox World. This year’s VBS will utilize music to educate and instill a desire for prayer and the liturgical services of the Holy Orthodox Church. Various non-liturgical music will be taught which contain many prayers, hymns, and melodies from the services. This music is a “bridge” for the children to cross over from secular experience to the liturgical worship of the Church. Communicate that the Church’s most important task is to worship God—the Holy Trinity. Encourage an active role (of prayer) in the Church services. Teach that our lives should revolve around the prayer life of the Church community. Teach and encourage an Orthodox vision of structured personal prayer life. As an introduction to a personal prayer life the students learned how to pray not only for themselves but the whole world—God’s creation! This was accomplished by discussing each of the petitions of the Great Litany which is the opening litany for many of our Church services. Lord, Have Mercy—Again and Again! Question for you to discuss with your child before VBS tomorrow: How is the Great Litany like a ladder? On Wednesday, there will be Vespers at 5:00 p.m. Please try to bring your children early so that we can pray together. Dinner and VBS will follow immediately. Please be prompt in picking up your child each day at 8:00 p.m. Don’t be late! 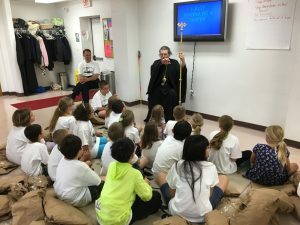 STATE COLLEGE, PA — It was pizza day and as the VBS kids met for the last time this year, they gathered with our Archbishop Melchisedek to hear his words on being the shepherd of a flock. 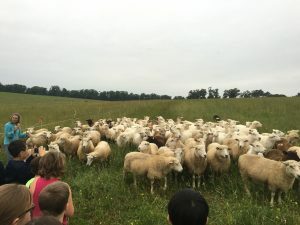 It was stated that his flock is different from flocks of sheep that the kids had the chance watch yesterday (see article below). As the week began with the students uttering the first words of Psalm 23, “The Lord is my Shepherd” today the VBS concluded with the affirmation, “I will dwell in the house of the Lord forever.” The sheep are content and “at home” with the shepherd—and want to stay with Him forever. 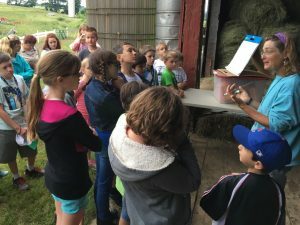 On Thursday, the Holy Trinity VBS took it first ever field trip to a sheep farm in Sunbury, PA. After a 1.5 hour bus trip, the students were greeted by an array of farm animals but mostly by a whole lot of sheep. 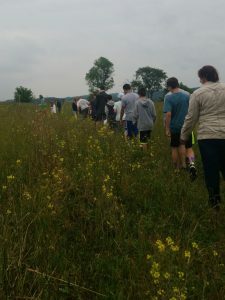 During the tour the students were able to pet the sheep, walk through the pastures, and learn about a sheep’s necessities (water & salt) and some of the dangers (copper, falling over). It was particularly fun to see the shepherd Caroline and her dog gather the sheep and run them back and forth – and how well the sheep followed the shepherds commands. At the end of the tour each student was given a piece of wool from one of the sheep as a keepsake. 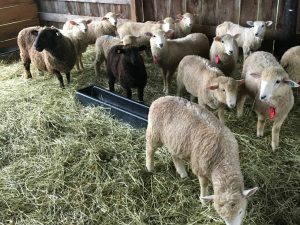 All the “sheep” returned home safely and happily. It was once again a great joy and pleasure to be with your children this week. It was a bit hectic but it was fun and they are going to be amazing sheep. As much as possible include Psalm 23 in your daily prayers and with your children. Knowing the meaning behind the words will give them great comfort and peace. Thanks! For more recaps, pictures, and information, visit the 2016 Vacation Bible School homepage. 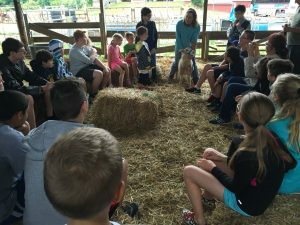 VBS Kids See First-hand What Sheep Are Like! 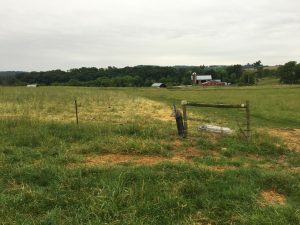 STATE COLLEGE, PA — Today there was no issue of the VBS Daily News because our reporters were in the field—literally. Here are some pictures from the remote location. On Friday, there will be Vespers at 5:00 p.m. Please try to bring your children early so that we can pray together. Dinner and VBS will follow immediately. Additionally, our bishop will be visiting and will share some “shepherding” stories with the kids.